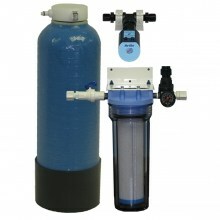 The system has a flow rate of 5-Liters/minute and includes two DI tanks (one installed plus one spare), an activated carbon prefilter assembly with pressure regulator and gauge, and a 2-Megohm-cm purity monitor. The monitor has a Green LED to indicate that the system is producing >2 megohm-cm Type II water. When the water quality drops below 2 megohm-cm a Red LED flashes to alert the user that it is time to replace the DI module. The AQUA SOLUTIONS' Model 2618S1 is also available in a Dual module version: Model 2618S2. Ultimately, dual-module systems cost less to operate. This system is designed for use on pre-treated RO water or good quality tap water containing up to 85 PPM of total dissolved solids and is for applications that require 20-40 Liters of Type II DI water/day. The system includes one installed plus one spare DI Module. Ion Exchange Capacity is 3,000 Grains. Feed Water Quality Tap water or RO pretreated water.